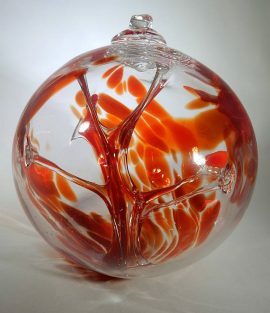 Because each witch ball is hand-blown glass, each one is unique and may vary in appearance from the photo – greater selection and more photos coming soon! 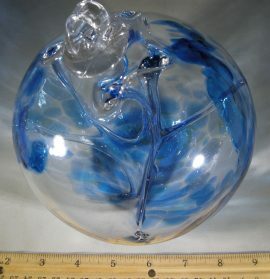 You can enjoy the one of a kind design inside this handmade Blue, Witch Ball, Large. Witch Balls were historically hung in the home. Their glittering strands and sparkling bubbles were thought to ward off spirits and promote peace and harmony. 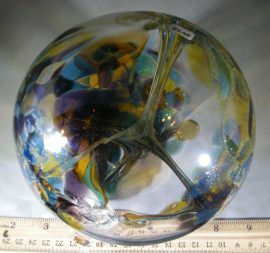 Witch Balls were historically hung in the home. Their glittering strands and sparkling bubbles were thought to ward off spirits and promote peace and harmony.